This review first ran in the July 20th edition of The Hamilton Spectator. The future belongs to math majors and computer geeks. They’ll be the MVPs of our organizations, knowing how to sift through mountains of raw data to unearth that one insight that tilts the playing field in our favour. Just how much data is out there in our big data world? Take Major League Baseball as one example. Player-tracking technology holds the promise of generating 2.4 billion data points on every pitch, swing, hit, miss, catch, throw, run and out from all 2,430 games in a MLB season. A single game will yield terabytes worth of data. Analysts will mine that data for coaches and general managers looking for any edge to win it all. Compare that to the early 1980s when MLB teams had access to just over 200,000 manually collected data points. So what you can do with databases jammed with big data if you get the algorithms right? In 2013, the Pittsburgh Pirates broke the longest losing streak in North American pro sports. It had been 20 years since the Pirates played a season where they won more games than they lost. Fans weren’t flocking to the ballpark and both the coach and general manager were on the bubble. The small market team couldn’t spend their way to a winning season. Forget upgrading the talent on the field. The Pirates had holes to plug in their starting line-up and just $15 million to shell out on free agents. The Pirates were left to rummage through the bargain bin for cast-offs and reclamation projects while big market teams dropped $20 million or more on a single player. So the Pirates front office did a deep dive with big data and came up with a strategy to win more games by allowing fewer runs. “The playing field had been financially tilted against small-market teams, such as the Priates for years,” says Travis Sawchik, author of Big Data Baseball and a sports reporter with the Pittsburgh Tribune-Review. “They couldn’t afford evaluation mistakes, and they couldn’t attract stars like the Yankees, Red Sox or Dodgers. Instead, the Pirates were literally going to attempt to shift the playing field in their favour. The data showed three things. Batters hit more ground balls when pitchers threw two-seam sinking fastballs. You can’t hit a ground ball out of the park. More of those ground balls could be caught and turned into outs if infielders and outfielders shifted where they stood on the field. And pitch framing was a catcher’s most valuable skill, turning balls into strikes. So the Pirates went out and signed free agent Russell Martin, one of the best pitch framing catchers in the game, and pitcher Francisco Liriano who was coming off a nightmare season with some of the ugliest stats in MLB. Yet both players would play key roles in leading the Pirates into the postseason with their first winning season in 20 years. 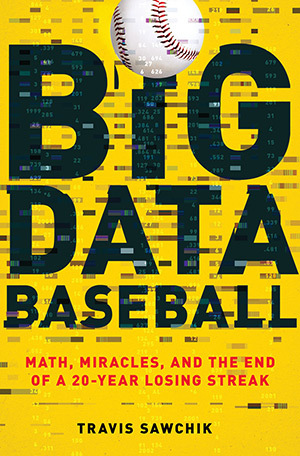 Big Data Baseball is instructive on two fronts. It makes a convincing case for why organizations need to staff up on data architects and analysts and make major investments in software. The book also underscores the importance of culture change. Big data’s useless if you’re unwilling to act on what it tells you. Like MLB teams, lots of organizations are bound by traditions and ruled more by gut instinct than data-driven decisions. “Going against conventional thought requires courage and conviction because, when such an unorthodox attempt fails, public criticism is intense,” says Sawchik. But when those unorthodox attempts succeed, the rewards are well worth the risks as long-suffering Pittsburgh Pirate fans will attest.